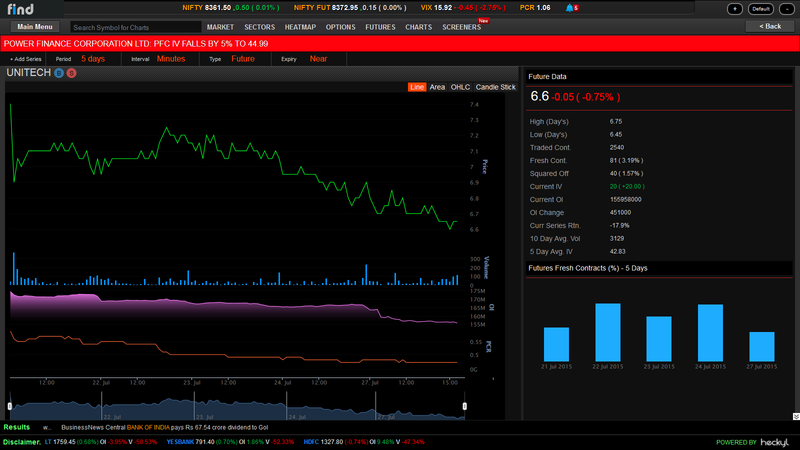 Heckyl’s FIND Futures & Options platform allows users to visualize price movements, OI, Volume & Rollover % sector-wise. This provides users a complete picture of the sector performance in one view. E.g. Sectors that are driving the market, sectors that might cause a reversal, lack of traders commitment in sectors (using OI) etc. In this post, we will see how we can use Heckyl tools to predict individual stock movements through a basic top down approach. Below is a snapshot of the Heckyl Sector performance chart for 28 July, 2015. As evident, realty sector has experienced the largest drop of 3.21% at the opening bell. Realty & construction sector comprises of nearly 5% of the total market cap. An increase in open interest along with a decrease in price mostly indicates that short positions were being built up in the sector. With the overall market looking weak, shorting a sector with shorts being built up, turns out to be a low hanging fruit. 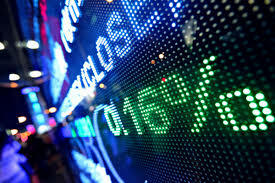 Heckyl’s platform offers real-time screener, which updates important actions happening in individual stocks. Since we narrowed down to realty sector, we shall be looking for updates in UNITECH, HDIL, DLF (realty sector comprises of these 3 stocks). At 11:27 AM, UNITECH crossed below its VWAP of 6.57 & was reported by Heckyl’s Screener. Using the volume-weighted average price (VWAP) while trading in short-term time frame is simple & effective. One robust strategy is to short when the price crosses below the VWAP, logic being, the price has gained enough downward momentum to move out of its current trend. VWAP’s have high significance in detecting imbalance in the price. Let’s take a look at how the stock has been looking on the charts. Price action since last 5 days indicated UNITECH was in a downtrend with a gradual increase in volume. 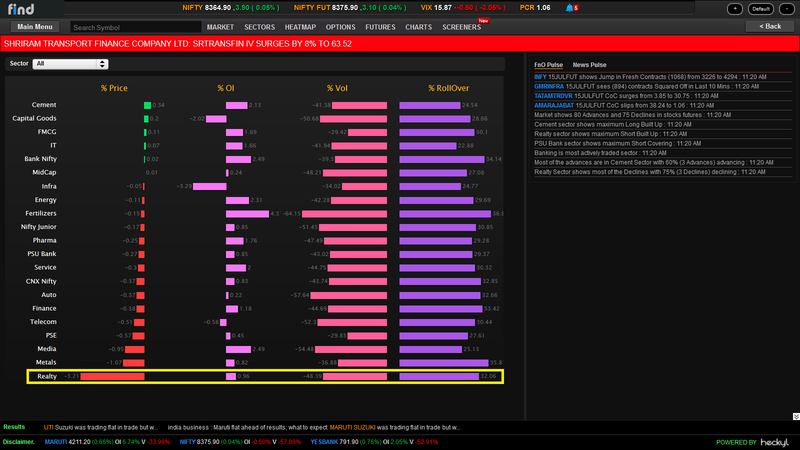 Combining this with the OI short built up, we are seeing an increase in the supply volume for the stock. With stock looking so bearish, a prudent trade at this point could be a short sell or moving out of the longs. 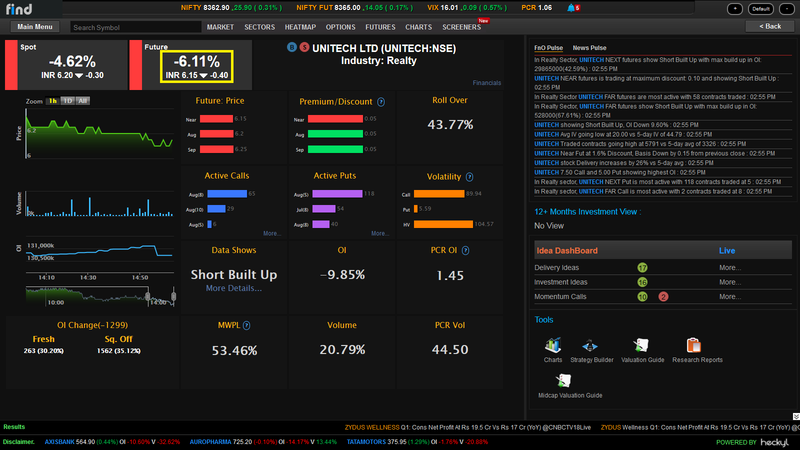 Consequently, UNITECH dropped 4.58% following next day’s open. As we just saw, using Heckyl’s one-stop Stock dashboard & alerts, traders can make an assessment of the market conditions in one view which enables steadfast decision-making in real-time. Successful trading is all about rapid decisions & robust analysis, & Heckyl’s FIND platform becomes a necessary tool in a Trader’s toolbox. For more information write to us at info@heckyl.com. This entry was posted in Home, Product Beat and tagged alerts, analysis tools, DLF, Futures and Options, HDIL, Heckyl, Heckyl Charts, Heckyl FIND, OI, Real Estate, Realty Sector, Screener, Stock Dashboard, Unitech, VWAP. How Heckyl’s F&O platform can help you to make money? 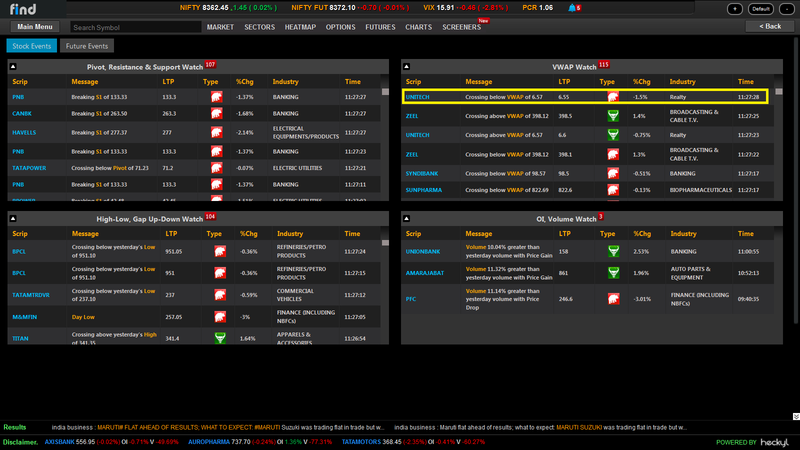 I am using india info trading.How can i see VWAP(Which showed above) Screen in india infoline. Please send us screenshot, we are not able to access page directly. As of now it’s shown in Screeners. Please find my IIFL Screen.I am unable to see’Heckyl’s Screeners Dashboard on the Futures & Options Platform’.Can you please help me how to find this in IIFL. In IIFL version they do not have screeners, they are upgrading to next version soon. Please see me profile pic which i have in IIFL site.I think Heckyl’s Screeners Dashboard on the Futures & Options Platform is not activatd in IIFL.I am not Seeing Screeners after charts.If this is correct how to get this screen.is there any other way to see or purchase it.